The Dangers of Driving in the Rain | Merkel & Cocke, P.A. Even when the weather is good, Mississippi drivers aren’t known for being the safest drivers in the nation. Many drivers cause accidents due to driving while intoxicated or driving when distracted. When the weather gets foggy, too sunny, extra-windy, or even snowy, it pays to drive defensively. One common weather condition that all Mississippi drivers should prepare for is the rain. The Sun Herald reported recently that Safewise, an insurance safety group, found that Mississippi ranks second-worst in the country for rain-related accidents. The only state with worse odds of being in a rain-related crash is Arkansas. Drivers should take some or all the following steps when the rain begins to fall. Failure to take these steps can cause car and truck accident injuries. Drivers who fail to act responsibly should be held accountable for the victim’s pain and suffering, medical bills, and wage losses they cause. If a driver kills someone, the family of the decedent can hold the driver liable for wrongful death damages. Car owners can be held liable for the negligence of their drivers. Use your headlights. When it rains, it can be hard to see through the rain drops and the dark from the clouds. Headlights serve two purposes. They allow the driver to see farther down the road. Headlights also make it easier for other drivers to see you. Understand the risk of hydroplaning. 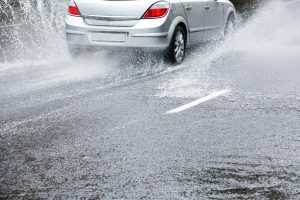 Hydroplaning occurs when your car or truck tires are riding on the water instead of the road surface. Driving on the water makes it easier for the driver to lose control. Even a slight bit of rain can cause hydroplaning. Rotating and balancing your tires can help reduce the risk of hydroplaning. Slow down. Slowing down helps reduce the risk of hydroplaning. It also gives you more time to react to emergency traffic situations. Slowing down can often mean going slower than the speed limit, which is legal (and often sensible) in a storm. Get off the road. If the rain is torrential, pull off to the side of the ride or go to a rest area as soon as possible. Wait for the hard rain to stop before resuming driving. Don’t use cruise control. Cruise control increases the risk your car or truck might hydroplane. Allow for more stopping distance. It will be harder to brake in the rain. So, don’t tailgate and don’t get too close to any vehicles in front of you. Make sure you can avoid rear-ending the car or truck in front of you – without slamming on your brakes. Don’t pass and be careful merging into another lane. Shifting lanes during the rain increases the risk of an accident. Put more than 200 years of combined experience to work for you when accidents change your life. At Merkel & Cocke, P.A. our Mississippi car and truck accident lawyers have the experience and resources to help you get justices. We are strong advocates for each and every accident victim. To speak with a caring attorney, phone us at 662-799-1633 or complete our contact form to schedule a free consultation. From our offices in Jackson, Clarksdale, and Oxford, we fight for clients throughout Mississippi, including in Tupelo and throughout the Gulf Coast Region. We represent clients in Tennessee and Arkansas, and in federal courts in all three states.